Any boat owner knows that having the right marine battery charger in place is vital. Not having a suitable battery makes maintaining and using your boat so much harder. And if your boat has three marine batteries, it’s particularly important to have a three bank charger. Anyone who’s tried to charge three marine batteries with a single bank charger in the past knows how troublesome, time-consuming and difficult that can be. If you’re in need of a new marine battery charger, we’re going to help you out by looking at which ones on the market today are the very best. These three bank chargers are all very impressive and capable of meeting your needs. So read on and learn about what each of them offers you and then decide which one’s going to be right for you. 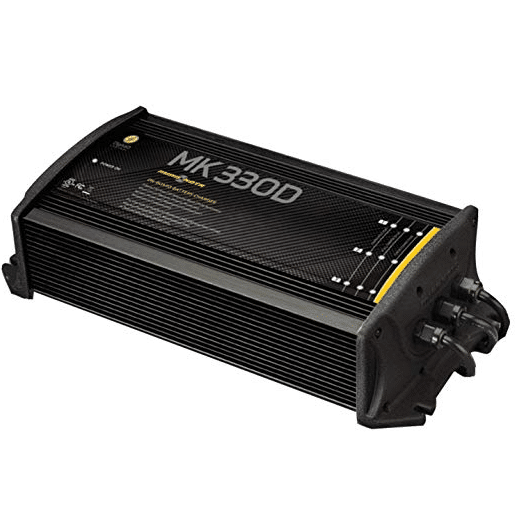 This MK 330D On-Board Digital Charger is one of the most popular on the market right now. It’s affordable for most people, while still offering the performance and reliability that you expect from your marine battery charger purchase. It’s perfectly able to protect your boat’s batteries and that’s something that every boat owner should be taking seriously. 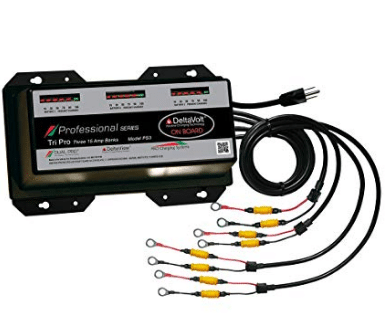 This marine battery charger is able to monitor both the temperature and the voltage being output, allowing it to stabilize these things and ensure it doesn’t overcharge. This is what you need from a good-quality battery in order to keep it properly efficient at all times. In the end, it will help your batteries to last longer. The chargers on this device are filled with epoxy, and it’s this that makes them completely able to withstand exposure to water and shocks. This is important when you’re on the water and there is some kind of wave impact or turbulence that might cause problems for lesser battery chargers. For the best results, you need a battery charger that’s able to tell exactly how much charge is needed at any particular time. 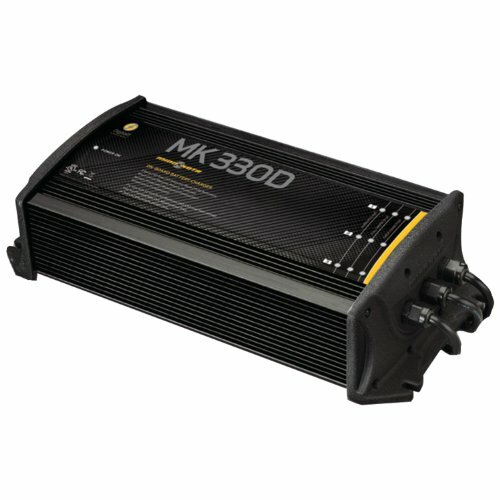 THe MK 330D has a microprocessor built into it that monitors the batteries, ensuring the right amount of charge is delivered all the time. It’s an important safety measure too. 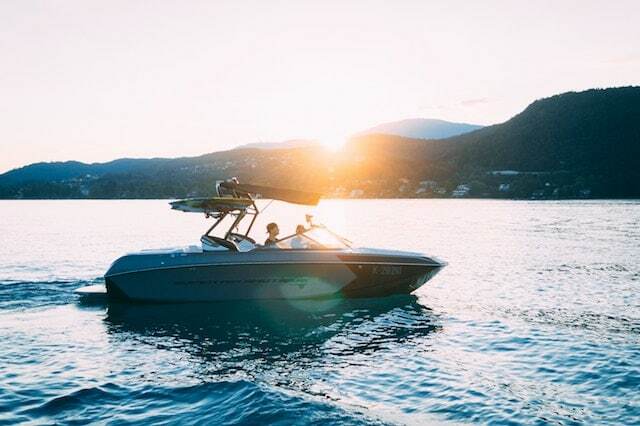 If you are going to be using your boat in a location where the temperature is pretty high, it’s important to have a charger that can prevent your batteries from overheating. A temperature compensation system is the best way to do this, and it’s what’s offered by this battery charger. It takes the temperature in the environment and adapts accordingly. 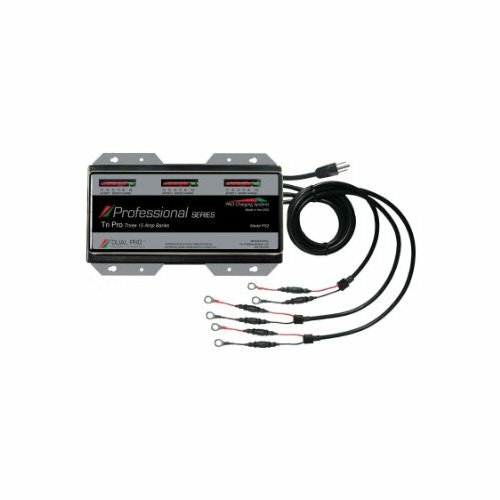 Fast charging matters to many fishers and anglers, so if you’re serious about fishing and you want to make sure that you’re always able to keep your boat moving at the speed you want to keep it moving at, this ProMariner battery charger could be what you’re looking for. Here are some of the best things about it. 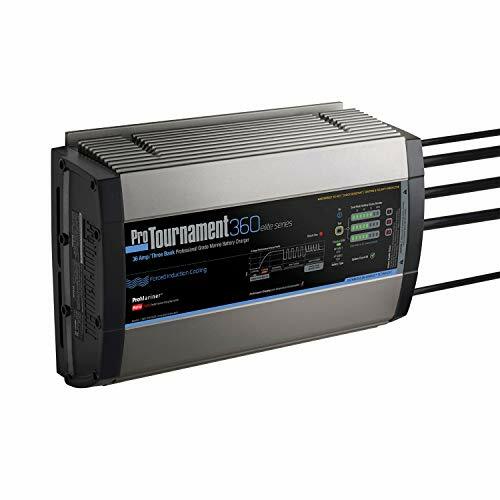 This five stage charge profiling offered by the Promariner Protournament battery charger helps with recovering the batteries and allowing them to endure for longer over time. It’s all about taking care of the batteries and making them usable and efficient for as long as they possibly can be. It’s a feature not every battery charger possesses. Another appealing feature of this charging device is the distributed charging method it employs. It essentially makes use of all the amps, meaning it can charge the battery faster because every possible component and element is being made use of and none of them are going to waste or standing idle. Something else that increases charge speed is a lower overall temperature. If you allow your battery charger to overheat, it will take longer to charge the batteries. But this model uses a force induction cooling fan to keep the system cool at all times when it’s in use, so you won’t have to worry about overheating. A display that shows the system status allows you to stay on top of what your battery charger is doing and how much more it needs to charge before the charger can be disconnected. It can also detect and highlight any faults that you should be made aware of. It uses LEDs so is very bright and easy to use. 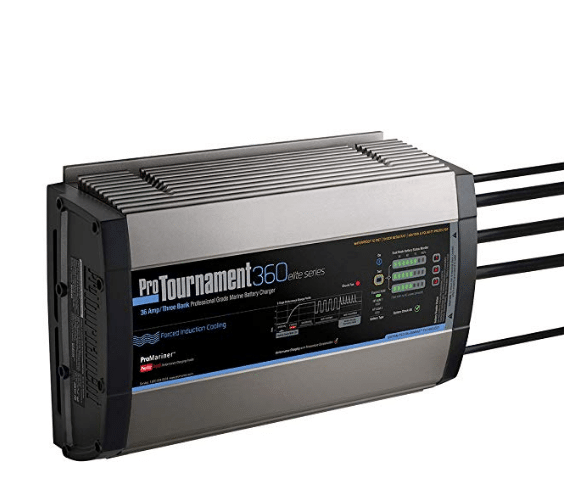 Tournament Winning Technology: 100 percent charge upon completion of multi-stage charging process. 100 percent charging output with AC power as low as 90 VAC. 50 percent lighter and 2 to 3 times faster than traditional chargers. If you’re looking for power and you want a marine battery charger that makes use of the latest battery technology, the Minn Kota Precision charger is worth considering. There are lots of things that make this charger stand out from the crowd. Most notably, it’s packed full of features that other marine battery chargers don’t offer; learn more about them below. You can choose what each bank should be doing and which battery type it should be connected to. The ease with which you can control and switch these settings is very impressive, and it makes the overall experience of using the Minn Kota Precision battery charger so much more enjoyable than it otherwise would be. Everyone wants their batteries to remain healthy and productive for as long as possible, and the right marine battery charger can assist you with that. The Minn Kota Precision uses a lead acid battery equalization process that cleans the battery and keeps them functioning for as long as possible. The voltage and amps being delivered to the batteries from the charger is entirely controlled by the microprocessor. No input is required, and all of the difficult stuff is taken care of. That’s the way it should be and the Precision model never feels like hard work for you as a result of its fantastic and efficient microprocessor. The ability to automatically adjust the voltage by itself is really important. It makes the charger safer and protects the battery from all kinds of unnecessary harm. 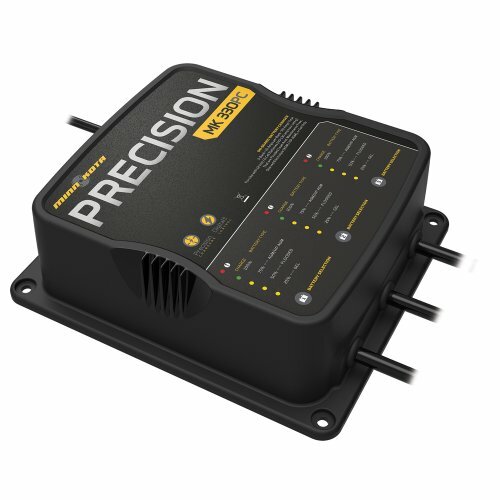 This voltage compensation system is a nice added bonus to have, and it might be a feature that makes you choose the Precision charger over any of the alternatives. This smart battery charger is both safe and able to get the job done very quickly, and those things are both significant and important for anyone who owns a boat. Safety is something that should always be taken into account when buying a charger, and the performance of this model is just as good too. Here’s some more information about the main benefits of this product. The NOCO Genius is completely sealed, and this matters for a few reasons. First of all, it means that the charger is completely waterproof and you won’t have to be worried about any water getting in there. There’s all kinds of damage that can occur when you’re on the water and experiencing turbulence, but this charger will remain sealed. 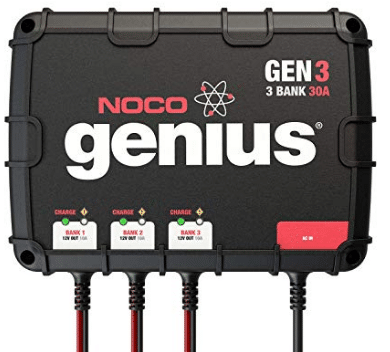 Safety was clearly a top priority for the people designing and creating the NOCO Genius battery charger. No sparks are generated at any point during the charger’s usage and problems like overheating and short circuiting have been guarded against. You simply won’t have to worry about those problems at all. 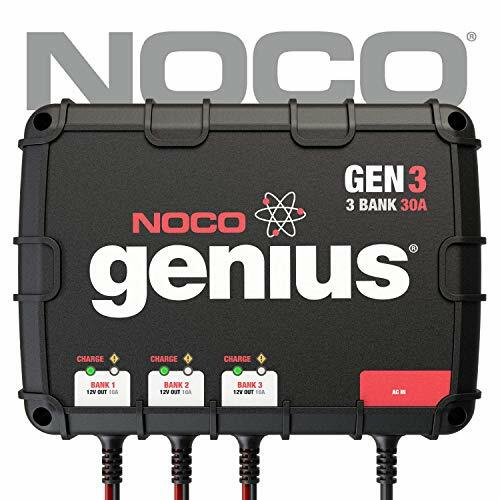 Because of the rapid charging technology that has been put to work inside this latest model of the NOCO Genius, you’ll be able to get your batteries back up to full charge faster than ever. This version 3 model does the job a whole two times faster than the previous version 2 model. A 30 amp (10 amp per bank) on-board battery charger for charging and maintaining three 12-volt batteries independently. This battery charger is very nicely designed and looks very streamlined. It’s portable, easy to use and has a variety of applications that you might want to make use of. It’s built in a way that make it sustainable and durable, and when you have it in your hand you know that you’ve bought a quality item, not something cheap or disposable. One of the first use the Dual Pro Professional Series charger, you’ll notice how strong it feels and how robust it is. If you’re looking for a battery charger that’s going to do the basics well and remain strong and robust at all times, this one should not be dismissed. There are lots of sporting activities that this charger can be used for. Of course, it’s ideal as a marine battery charger and can be used on the water when you’re out on your boat. But it can also be used when charging batteries on land for other sporting situations too. 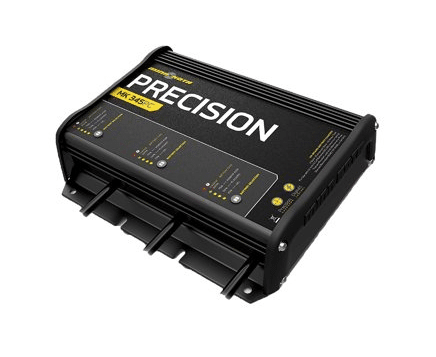 The efficiency of your battery clearly matters and this battery charger is known for being efficient. You won’t waste any power and you won’t be let down by its performance either. It might not be kitted out with incredible features, but it does what it does very well, and that’s what matters most to lots of people. Copyright © 2018, WatercraftWatch.com. All rights reserved.